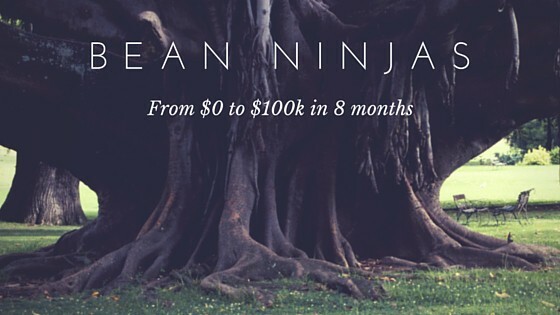 The story of Bean Ninjas’ business growth continues… I was planning to write quarterly reviews, but I was pretty excited about February so I decided to write an 8-month review instead! A few reasons. 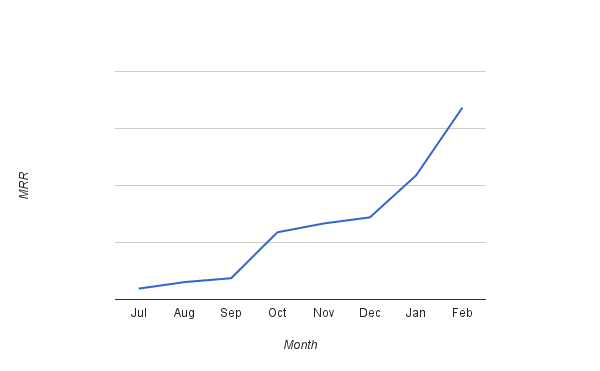 We …..
Hit our first major goal of an annual run rate of $100k (customers on subscriptions). This was the first big milestone we set for ourselves and we weren’t expecting to hit this until at least the 12-month mark. Were interviewed on a podcast and blog which was a first for both. 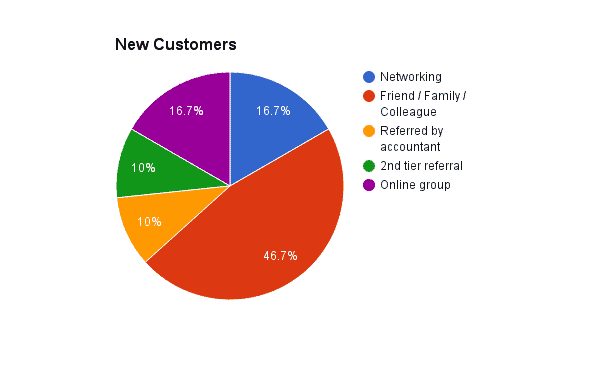 At 29 February, after our first 8 months in business, we had 45 customers and $8,400 of monthly recurring revenue (MRR). You’ll notice a spike in October and then again in January and February. These are the months that tax filings are due and this deadline seems to be the encouragement people need to sign up! In the 8 months we’ve been operating we’ve only had one customer leave. 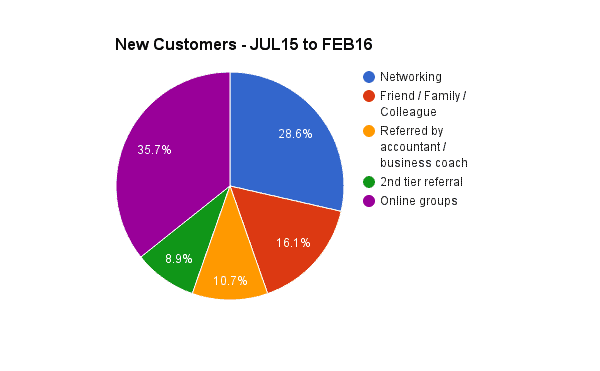 We’re really happy with our customer retention rate and this is one of our focus areas. We had an exit interview with the customer who left to understand why they were leaving. They let us know they’d been happy with our service but wanted to use Quickbooks which they also used for a related business. 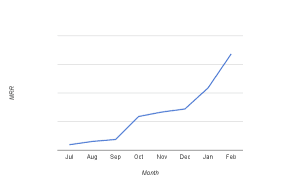 I like to think that our growth each month indicates we have fair pricing. To maintain accuracy, my co-founder Ben still reviews all work. We know this isn’t sustainable at the rate we are growing, so we’re busy building our team so we can have someone else to help Ben with quality control. We aim for response times of less than 24 hours. 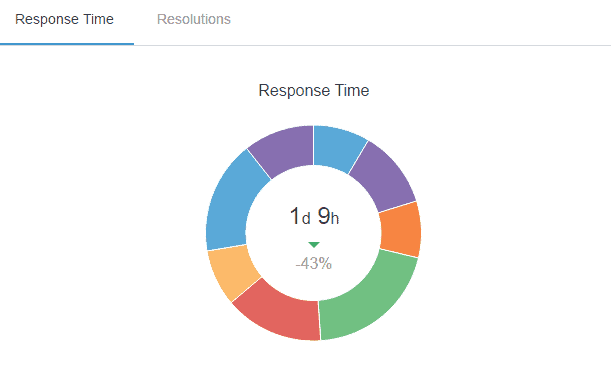 This month our average response time was much higher at 33 hours (1 day and 9 hours) . It was disappointing that we didn’t meet our target response time during January and February. Ben is in Helpscout daily working with the team, so we know very quickly if response times are dropping. We could see response times dropping, but our team was at capacity so we couldn’t immediately improve them. We’ve learnt from this and will start our next hiring process earlier …. in anticipation of needing staff rather than starting the process when we already need extra staff! We are working towards training other staff to assist Ben in managing the team, so tracking these metrics will become more and more important in the future. Friends / family and colleagues were the main source of customers during our first 6 months. We were really pleased to see that during January and February our new customers are coming from other sources, with a big chunk of our customers coming from online communities. 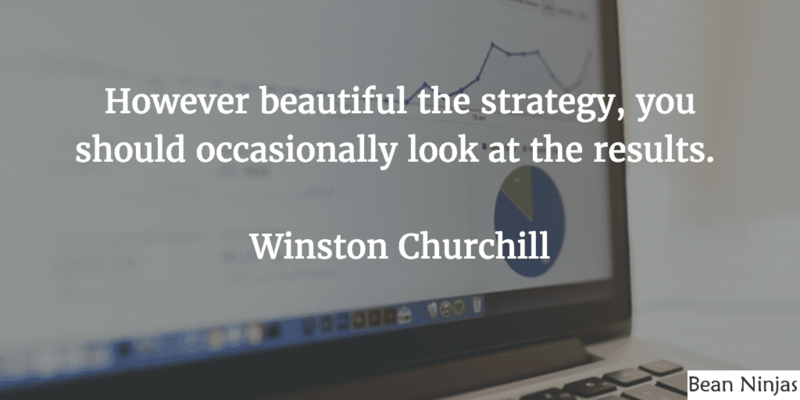 Tracking where our customers are coming from is key to helping us decide where to focus our lead generation strategies. We’ve been working hard at getting the Bean Ninjas name out there through blogging, being interviewed on podcasts / blogs, though social media and being active in various online communities. It took a long time to be invited onto a podcast and eventually I realised why. Not many people enjoy conversations about bookkeeping. Once I realised that the story of our rapid growth was more interesting, we started to have some success in being guests on podcasts. 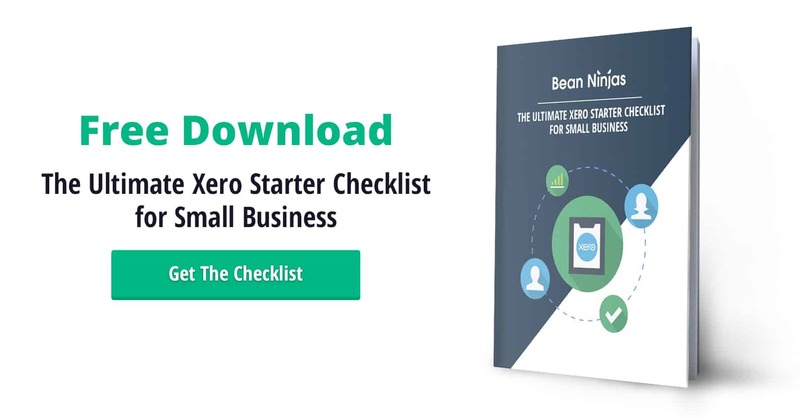 We’ve also been following along with Nathan Chan’s Instagram strategy and recently launched a Bean Ninjas Instagram account. Follow us here. We’re currently a team of 8 and we’re in the process of hiring 3 more bookkeepers. 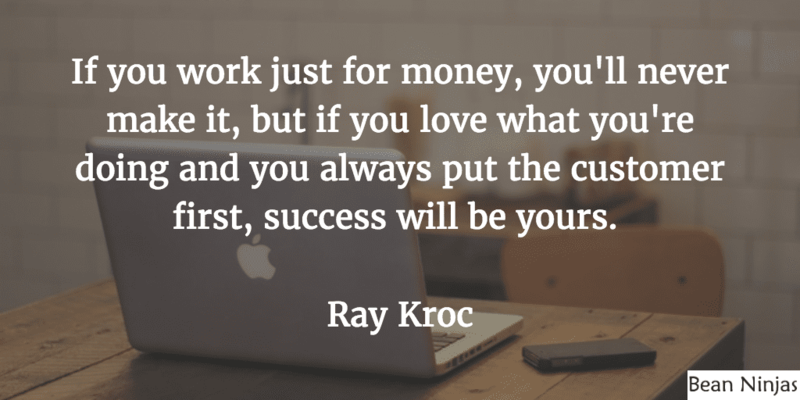 One of our goals for 2016 was that Ben and I would be working an average of 40 hours per week or less. We were closer to 60 hours per week during January and February and the lesson learnt here was that we didn’t start the hiring process for our new bookkeepers early enough. Again! This meant we both needed to jump in and help the bookkeeping team, similar to our busy period in October 2015. To avoid this happening again, we’re working on a ‘new customer’ trigger, so we know that once we’ve taken on a certain number of new customers in a month our bookkeeping hiring process is triggered. As our project for the 7DS Challenge in January we migrated email marketing platforms from Mail Chimp to Drip. 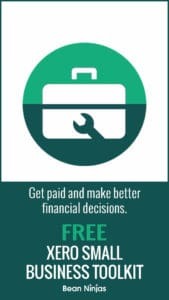 We also created an email course on bookkeeping, but apart from that we haven’t done much with Drip. Ben and I try to meet in person at least once a quarter to work on business strategy. We usually meet for a few days and run a ‘Business Bootcamp’ similar to the way we launched, often with only 1-2 hours allocated to completing a particular task. I was down in Sydney in February for the Super Fast Business Live event, so Ben and I spent a few days together beforehand. The next focus area is writing the content so we can implement the sales funnel in Drip.